Access to a ClusterTemplate is normally limited to the admin, owner or users within the same tenant as the owners. Setting this flag makes the ClusterTemplate public and accessible by other users. The default is not public. Transport Layer Security (TLS) is normally enabled to secure the cluster. In some cases, users may want to disable TLS in the cluster, for instance during development or to troubleshoot certain problems. Specifying this parameter will disable TLS so that users can access the COE endpoints without a certificate. The default is TLS enabled. If set to true, tiller will be deployed in the kube-system namespace. Defaults to false. Add tiller_tag label to select the version of tiller. If the tag is not set the tag that matches the helm client version in the heat-agent will be picked. The tiller image can be stored in a private registry and the cluster can pull it using the container_infra_prefix label. Controls if Magnum allocates floating IP for the load balancer of master nodes. This label only takes effect when the template property master_lb_enabled is set. If not specified, the default value is the same as template property floating_ip_enabled. If set to true, auto healing feature will be enabled. Defaults to false. If set to true, auto scaling feature will be enabled. Defaults to true. This label allows users to select a specific Node Problem Detector version. This label allows users to select a specific Draino version. 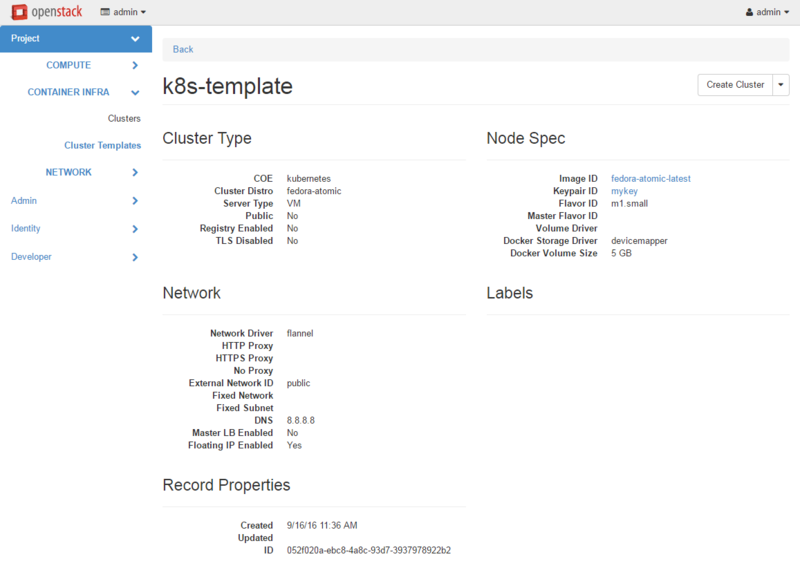 This label allows users to select a specific Cluster Autoscaler version. The minmium node count of the cluster when doing auto scaling or auto healing. Defaults to 1. The maxmium node count of the cluster when doing auto scaling or auto healing. This label is not used for octavia-ingress-controller. Overwrite existing files in the directory specified. The RESOURCE that generates the CADF Event Record based on its observation (directly or indirectly) of the Actual Event. The RESOURCE that initiated, originated, or instigated the event’s ACTION, according to the OBSERVER. The operation or activity the INITIATOR has performed, has attempted to perform or has pending against the event’s TARGET, according to the OBSERVER. The RESOURCE against which the ACTION of a CADF Event Record was performed, attempted, or is pending, according to the OBSERVER. The result or status of the ACTION against the TARGET, according to the OBSERVER.